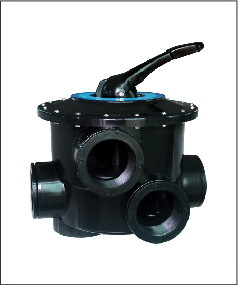 Side mount valves available in different sizes. with heavy-duty plastic handles and are 100% factory tested. DRAIN: by-passes filter, the water drained away directly. FILTER: for normal filtering and regular vacuuming. BACKWASH: for cleaning filter sand bed of accumulated debris. RINSE: used after backwash to flush valve. WHIRLPOOL: circulating water to pool by-passes filter. CLOSED: shut off all flow to filter and pool.